Vacation, Take One | Map This! 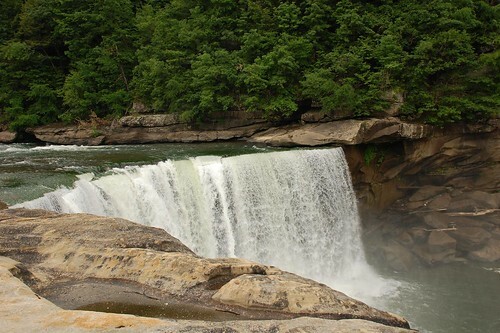 Yesterday my family left on vacation for Cumberland Falls State Park in southeast Kentucky. After about six hours of driving in the rain, we arrived and checked into a very nice two story cabin that could sleep about 10 people. Three TVs. Cable. Kitchen. 2.5 bathrooms. Very nice. We win. Aside from taking in the rainy Kentucky scenery yesterday, Karen, Rachel, Blair and I played Wii Fit for several hours last night, while Mom and Dad did their own thing. This morning we got up relatively late and then walked/hiked around the falls area on the Cumberland River. It was very pretty, and I’m uploading pictures to Flickr right now. I’ll keep them updated as I can throughout the week. Vacation has, of course, had its humorous anecdotes. Take just a minute ago for example: Karen and I have been in the lodge using the Internet for the last hour, and she was getting thirsty so we went to find a drink machine. Because she brought her laptop in her purse-bag-thing, her wallet is at the cabin, and I just have one, $1 bill. We got down to the vending machines and were so excited to see that they have Diet Dr Pepper. Only one problem, though: the Diet Dr Pepper is in the bottle vending machine, which costs $1.50. Our excitement slightly lowered, we then tried to put our dollar in the 12 oz can vending machine which costs $1. It didn’t take my money. Instead of being smart and going to the front desk to ask for change, we tried to put it in an older looking food vending machine to get change (Karen’s idea, I might add.) Did we get our change? You guessed it. The machine sat there staring at us blankly. What’s your problem? Why do you want change? You put in your $1.00. DAH! So Karen and I decided to buy the least thirst-causing candy available in a land of salty, sugary goodness: an Almond Joy bar. We now have $0.25 and nothing to solve our thirst problems. I’ll update again when I get the chance!